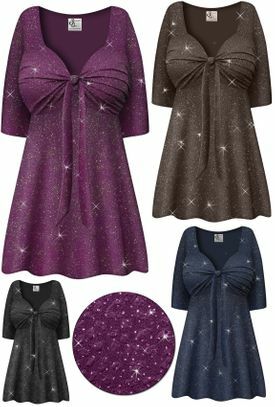 This is a gorgeous embossed glittery fabric! It is a deep rich color that has glitter dots throughout. This elegant babydoll top has 3/4 sleeves and a long tie in the front. The fabric is wonderful & a breeze to take care of! Throw it in the washer, dryer, and straight into a drawer or suitcase, take it out days or weeks later, and it's ready to wear! As with all the slinkies, they rarely wrinkle, are very stretchy, and hang great! A skirt is also available in the same material in various lengths, see Skirt option above for length and pricing information.